Saturday we trucked ourselves and a bunch of shellfish over to the first Saturday Bellevue Farmers Market of 2010. 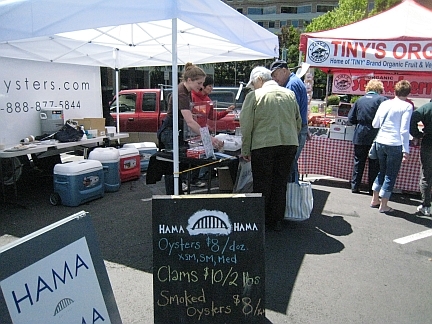 It was a beautiful and fun day at the market, and the smoked and pickled oysters went over like a helium balloon. Thank you for coming to Bellevue! I can’t wait to make the curry oyster stew! See you next Saturday! I was wondering if you were going to show up! It’d be great to see you guys on that side of the pond. sorry we missed you this last Sat. We were at a different function. Next time we are in town. Thanks Linda! Monica’s event was fantastic, wasn’t it? After learning about your farm on the event that Monica Downen had there, we followed you to Bellevue last week. We will be seeing you again soon! Your clams were just as good as we remembered!